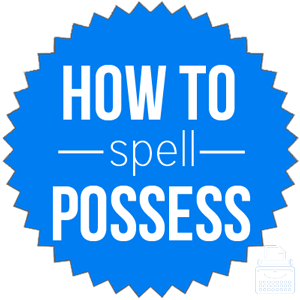 Spelling of Possess: Possess is spelled p-o-s-s-e-s-s. There are two sets of double “-s’s”; one in the middle and one at the end. Definition of Possess: Possess means to have and hold, either property, a skill, ability or knowledge. It also means to seize and take control of, as in to take into one’s possession or to bring into someone’s or something’s influence or control, as in an emotional state. Pronunciation of Possess: Possess is pronounced pe-zes. What does possess mean? Possess is a transitive verb. To possess something means to have or to own (something or someone). Also, one can possess or have specific knowledge or a skill, quality, or ability. It is true that this man possesses great wealth and power. You must possess a bachelor’s degree in a related field and the knowledge of Latin in order to qualify for this job. Possess also describes the act or state of entering into or taking control of someone or something, as in a being that is under the control or influence of an emotion or even a spirit. Let the positive energy possess you rather than the negative. It was as if a demon possessed her and she was no longer in control of her own actions. By adding, “-ive” to possess, the adjective is formed. Possessive describes someone or something that shows a desire to own or control someone or something else. Additionally, in grammar, a possessive is a word or group of words and symbols that denotes ownership or possession. The dog may become aggressive with strangers as she is territorial and very possessive of her masters. In English, the possessive is usually expressed by adding an apostrophe and “-s” to a word, whereas in French, this is not possible. The word possess was first used in the 14th century, according to Merriam-Webster’s. Possess comes from Middle English possessen, from Old French possesser. Originally, it comes from the Latin word possidere, possess-, occupied, held. The Latin verb possidere is from potis, meaning able + sedere, sit. Possess is a verb most commonly used to mean to own, have or control as one’s own. It may also refer to the state of being controlled or heavily influenced by another, an emotion, or even a spirit.